Throughout my life, I have been successful in many ways. I have genuinely succeeded in most things I put my heart and soul into. At a young age, I was a very happy kid and I was a good sportsman and during my school years fell in love with cross country running (I know, what was I thinking? ), but I truly did. In standard three (year 5) the school had its annual cross country races and to my complete surprise, I managed to come in 2nd place, to my schoolmate Richard Barlow. During that year I would try my hardest to beat him but I would suffer from stitch and could never seem to take him albeit he would only beat me by a few metres in the end. I was playing football and my grandad would travel 40 kilometres to pick me up and take me to my games. During our conversation on the way to football, grandad asked me how school was going and I told him about my stitch. he smiled and simply said, “Start singing while you run” and “train harder”. The following week I did what grandad had told me. I was pretty fit anyway but I started to run more and during my runs, I would sing “Waltzing Matilda” a song my grandparents taught me, which seem to work. Singing helps you to regulate your breathing and it’s a great way to prevent stitch. The next week I beat Richard by a decent margin. I went through Plimmerton School as a champion at cross country and even in the first form (year 7), I was fastest in the school being able to beat all the kids in the year above. At the regional competition, I run for the school as a senior during both my First and Second forms (year 7 & 8) and won my races by a few hundred metres each time. The reason I was so good was pretty simple, I loved what I did, I received great advice, I trained well, I was lucky to be in a school that encouraged kids to run cross country and I had some competition to keep me sharp, I was a very happy kid. This is very similar to the Five step formula, I and many other coaches will tell you, to be successful in life. You spend a lot of time at work, it is so important you do what you love or over 50% of it is wasted. As Nike tells us to. Find a way to follow your dreams, the fact you are following your own plan will make you happier even though you may need to work for someone else or work towards the career you will love. Don’t wait for the stars to align, they only align when they know from your actions what you want to do. Make it clear to them and they will respond in kind. A little bit of planning is good, but that’s all you need. Passion and positive actions will do the rest. One of the reasons I set up my business networking groups in the area I live is to ensure I am working with like-minded people. When you are surrounded by successful people you can learn from each other and gain the knowledge you need faster than you can by yourself. Celebrated success expert Jim Rohn, who is no longer with us, used to talk about something he called the Law of Averages – average the income of the five people you hang out with the most, and that’s what your income is likely going to be. This is because the way that people tend to think is contagious. Ensure you spend regular time with people who are positive and looking to achieve BIG dreams, they support you and your dreams, do this and your clients and your business or career will benefit! Don’t settle for what you have in life. Demand more of yourself think of ways you can not only continue to grow yourself but help those positive people around you. Learn and help others, If we all did this, the world would be a much better place. People love to deal with happy people. Whenever you are feeling a little lost, take a good look at yourself and start working on getting your smile back. Make the changes you need in your life to bring back the happy you. My biggest success is my family, they not only make me proud to be their dad they also help me smile when times get tough. I am very grateful to have been blessed with such a wonderful whanau. This a great blog well worth visiting. Everybody wants to eat, but no one is willing to hunt. 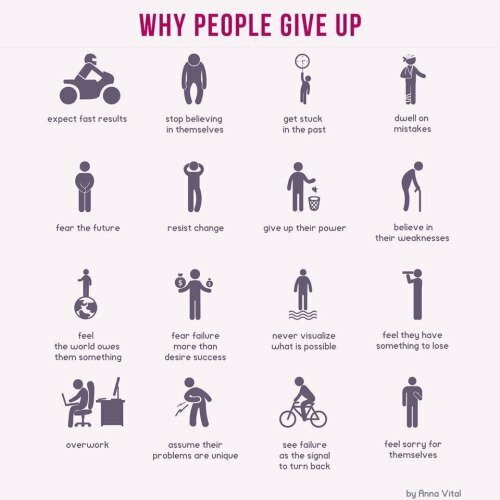 People give up for a number of reasons. The following list contains 16 of the most common of them.